The Maremma seashore, overlooking the Tyrrhenian Sea, features some of the most beautiful sand beaches of Tuscany. They stretch from Principina a Mare and Marina di Grosseto through Castiglione della Pescaia to Punta Ala and the blue sweep of the Gulf of Follonica, and afterwards along the spectacular etruscan coast, the Costa degli Etruschi up to Piombino. In the south they spread from the Ombrone delta into the wildest tiny gulfs within the Regional Park of Maremma. Some of these beaches are quite isolated and wonderful, from a natural viewpoint. They are very often embellished by sand dunes, behind which evergreen bushes lead the way to a flourishing and thick pine forest. This type of wood is very closely tied to the history of this land with its past of drainages. It is possible to reach from Podere Santa pia enchanting free access beaches like Torre Mozza or delightful, rocky coves like Cala Violina or Cala Martina. Cala Violina, is a spiaggia libera, a public beach and probably one of the most beautiful beaches in Italy. The sand of white grains of quartz “rings” underfoot like the strings of a violin. Castiglione della Pescaia is a famous and popular seaside resort town known for its sandy beaches and Tombolo pine forest. Castiglione della Pescaia, a delightful village of Roman origin, has developed on the summit of Mount Petriccio within mighty walls with 11 towers and 3 portals and the Castle XV, that keep intact their charm, such as small streets of stone, the ancient portals and arches. A castle which evokes the attacks of ancient pirates, a picturesque town with winding, narrrow streets leading to wonderful views over the coast, a port where all kinds of boats can berth, the clean water of the sea and the long sandy beaches with areas, just outside the city, which are still free from bathing facilities, a particularly pleasing climate: this is what makes Castiglione one of the most famous and most visited resorts of the Maremma coast. The ancient medieval fortress originally belonged to Pisa, then to Aragon, and to Siena. In the 16TH century it fell into the hands of the Medici family. In the 18TH century the grand duke of Lorraine, Pietro Leopoldo, started the reclamation of the Maremma marshes beginning from Castiglione. The so-called Casa Rossa (Red House) bears witness to the reclamation process with its Multimedia Museum of the Diaccia Botrona. On Saturday morning there is a market in Castiglione della Pescaia. The fine white sandy beach of Castiglione della Pescaia can be reached directly from town. Surrounded by pine forests and scrub, you can canoe along the River Bruna, which splits the town (the river mouth is a great place to buy fresh fish directly from the fishermen), into the cane thickets of the 2,600-acre Palude di Castiglione (Castiglione Marsh, also known as the Diaccia Botrona Nature Reserve), a popular bird-watching destination for its cormorants, herons, grebes and kingfishers. The representatives of the five neighbourhoods of the town take part to the traditional sailing race on the Bruna river. On the Saturday before the race the Feast of the sea is celebrated with the passing of the illuminated fishing boats leaving the port to bless the sea in honour of the fallen. On the last or last but one Sunday of the month fireworks are displayed. There are many places in the surroundings of Castiglione which are worth an excursion. A visit to the Etruscan necropolises of Vetulonia and to the ancient stronghold of Buriano is highly recommended. Other important Etruscan excavations are at Roselle, in the nearby of Grosseto. Diaccia Botrona Marshland is the last relic of a once large Etruscan and Roman lake - lago Prile - that lay between Grosseto and Castiglione della Pescaia. Long coastal dunes, the tombolo separate the marshland from the Tyrrhenian Sea. Diaccia Botrona is of great environmental importance, both for the variety of plant species, both for the role it plays in supporting the migration and wintering birds. Represent what remains of a wider area marshy, affected by an artificial water system, carried out at different times, for the remediation of a good part of the plain between Castiglione and Grosseto. Of interest is the geological formation of Macigno in outcropping along the road is the second Panoramica. The Emblem of padule and its bonifica is the Casa rossa, was built in the eighteenth century by Leonardo Ximenes, head of the works for the remediation from Grand Leopoldo, to flow water through a complex system of cataracts, and marginally was also used for catching eels. The marshland is a site of great environmental importance. Inside the Park one can admire admire white herons, red herons, ducks, the falcon of the marshes and the Cavaliere d’Italia. There is a visitors centre within the Riserva Naturale Provinciale Diaccia Botrona and guided boat tours are available through the marshes. Entrance is free. The multimedia Museo di Casa Rossa Ximenes (Reserve Museum, Via Ettore Socci 17) offers the opportunity to view the entire reserve and its wildlife via telecameras. The Casa Rossa Ximenes was built around 1765 on a project by the Jesuit Leonardo Ximenes, instructed by Grand Duke Peter Leopold of Lorraine to attend to the reclamation project of the Maremma area of the province of Grosseto. 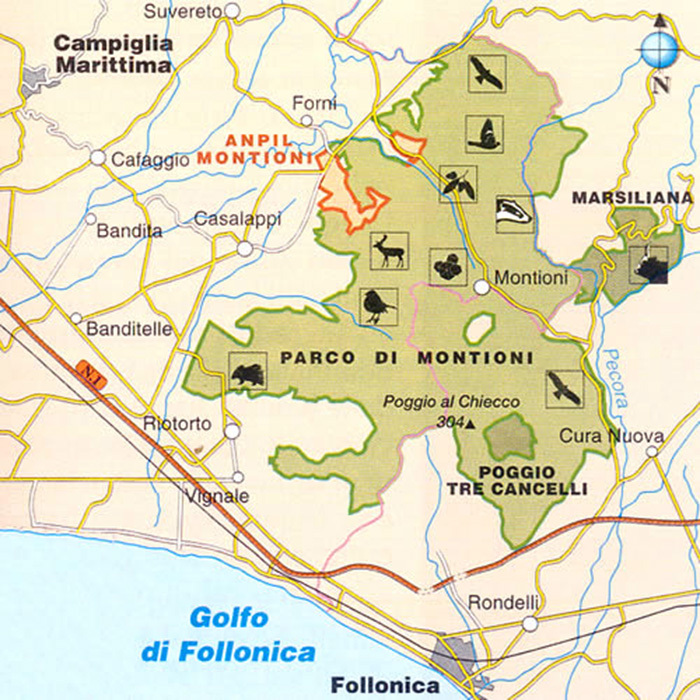 The scientist argued that it was not necessary to completely drain the lake of Castiglione, as had been previously attempted, but that its regimen had to be properly controlled so as to avoid stagnation, allowing it to continue to be an important source of income and occupation (fishing, hunting, transport, utilisation of swamp vegetation). Casa Rossa is a fine evocation of Ximenes’ commitment in the attempt to reclaim the area. Above the three large arches that characterise the structure, the large hoist room housed the machines and pulleys used to manoeuvre the floodgates, the middle one of which weighs about 40 quintals (4000 kilograms). The structure made it possible to control the outflow of the large canal known as the Canale Reale or Maestro, which permitted the exchange of the lake waters. This infrastructure served hydraulic and sanitary purposes, to drive mills and presses, water livestock, assure canal practicability and permit the rational exploitation of fishing, thereby permitting the lake to reclaim its old role as the centre of fish supplies for the grand duchy of Tuscany. from September to May, Thursdays, Fridays, Saturdays and Sundays: 1.00 p.m.-7.00 p.m. On June, July an August, Tuesday, Wednesday, Thursdays, Fridays, Saturdays and Sundays: 4.00 p.m.-10.00 p.m. Excursion on boat starting at 5.00 p.m. The Museum is situated in the Casa Rossa or Casa Ximenes (Red House or Ximenes House) which is 1 km circa from the old town of Castiglione. The building, which was built in the 1767 by the engineer Leonardo Ximenes and has been recently restored, was commissioned by the grand duke of Lorrain Pietro Leopoldo, who decided to start the ambitious project of reclaiming the Maremma marshes beginning from Castiglione. 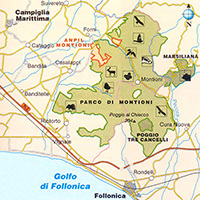 The Museum shows the nature reserve of Diaccia Botrona, a large, wet area of more than a thousand hectares close to the large Pinewood of Tombolo. This pinewood is what remains of the ancient Prile lake, which was reclaimed in the 19TH century. The nature park Diaccia Boltrona is characterized by a rare and important ecosystem where an incredible amount of animal and plant micro-organisms lives. Around 200 species of birds, among which the egret, the marsh harrier and the kite live in the typical marsh vegetation. 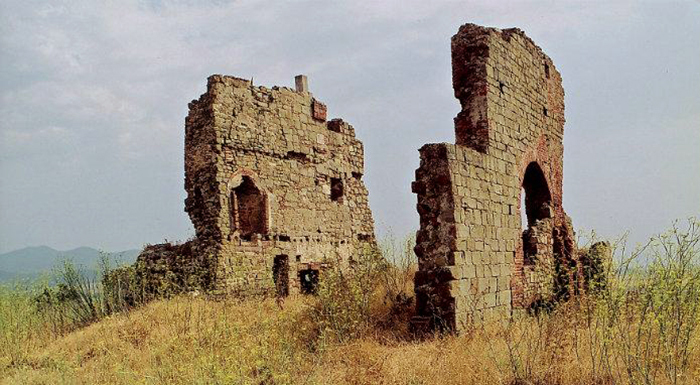 The Ruins of the Abbey of San Pancrazio al Fango are situated between Grosseto and Castiglione della Pescaia, in the Natural Reserve of the Diaccia Batrona. The monastery of San Pancrazio ad Lutum was built in the area known today as Badiola al Fango, on the islet known by the name of Isola Clodia. The monastery was established in the mid 12th century by Benedictine monks and also included a modest harbour. Only the remains of the building are currently visible: a single nave with semicircular apse made of large square blocks of sandstone. Vetulonia was Etruscan city, inhabited even in Roman times and location of a medieval castle, is located within the municipality of Castiglione della Pescaia. At the center of an important mineral area, Vetulonia was once a rich and powerfull etruscan city as one can guess from the imposing tombs of its necropolises and from it's rediscovered precious goldsmith. The visit of it's urban excavations, of the archeological museum and the necropolis will give us a better understanding of the the art, the craftmanship and funeral practices of the etruscans. The excavations of the city and the necropolis of Vetulonia are accessible throughout the days. The Museum, recently restored, is within the country in Piazza Vetluna. Tirli is immersed between holm oak and chestnut trees, and enjoys an exceptional climate rising to 450m above sea level being exposed to the sea breeze. First traces of settlements go back to woodcutters and shepherds and the wood cutting tradition is still deep rooted within the inhabitants. Enchanting are its alleys, the town is dominated by a convent fortress, built around 1500 by the AgostiniMonks; it is here that the inhabitants escaped to, and found refuge from the assault of the Saracenian pirates. Buriano, dominated by a castle, is of ancient origin, maybe Roman, according to other sources, maybe Longobarda. The Romanesque church has a bell tower incorporated and conserves a relic of Saint Guglielmo, that found refuge in the Romitorio. Every second Sunday after Easter, Saint Guglielmo is celebrated with an evocative procession that leaves Buriano and across the scrub reaches the Romitorio. In this occasion from the farm La Badiola, the pianeta is brought out, a gold embroidered material given by the Great Duchess of Tuscany Maria Antonietta in memory of a fall from a horse. The popular summer holiday beaches of Roccamare and Le Rocchette merge into one another along the Maremma Grossetana coast near Castiglione della Pescaia. Rocchette is a small seaside resort that takes its name from the rocky peninsula where a beautifully preserved 11th century castle stands. This fortified castle, set on a dramatic cliff-top, 100 metres above the sea, was build to defend the Etruscan coast from the raids of the Moors. The castle is now hunting lodge and summer residence of the Marchesi Lucifero. The hill of Le Rocchette is extremely fascinating because it has remained unspoilt surrounded as it is by scrub and pine trees. The modern touristic center of Punta Ala developed during the 20th century, especially during the Seventies: Punta Ala is situated on a tip surrounded on three sides by the sea and covered by pine woods and Mediterranean bushes, characterized by a pleasant climate and a limpid sea. It is renowed not only for the beauty of the territory, but also for its peacefulness. Punta Ala is an exclusive touristic destination, of refined beauty. Even if it introduces itself as a modern, functional and exclusive locality, Punta Ala was on border between the Principato di Piombino and the Granducato of Tuscany. Because of the fear of invasions were raised some fortifications to defend this coast. The Hidalgo Tower, the Castle of Punta Ala and the Tower of Appiani, built during medieval age on the small island in front of the coast, today only a ruin, are tokens of this defence. An old legend tells the story of a sow with its piglets that fell down into the sea to escape from hunters. From then on the island in front of Punta Ala promontory was called “Troia” (sow) and the rocks around “Porcellini” (piglets). Cala Violina, a stunning white sand cove, lies within the territory of the commune of Scarlino. The beach is only accessible by foot or bike. Cala Violina can be reached by the route to Cala Martina or by a dirt road indicated 400 meters before the gas station beyond Portiglione on the road to Castigione della Pescaia (between Marina di Scarlino and Pian d'Alma). A path of approximately 1 km leads from the parking area to the cove. Follow the Sentiero Cala Violina sign. A second option, and substantially longer route (3,8 km), is to take the private access road to the rocky cove of Cala Martina and then continue a further 1.8 km to Cala Violina. Cala Martina is situated within the Golfo di Follonica and the heart of the Riserva Naturale delle Bandite di Scarlino, a protected area of natural interest, extending over an area of nearly 6000 hectares, covering the municipalities of Scarlino, Castiglione della Pescaia and Gavorrano in the northern province of Grosseto. Bandite di Scarlino offers a lot of paths for those people who are fond of trekking and mountain bike. It is a large woody area overlooking the sea, rich in game and characterized by the Mediterranean maquis. Cala Civette is a delicious four-mile stretch of beach that unites the rocky promontories of Scarlino with Punta Ala. Cala Civette has a a fine and light sand. The beach is 20 metres wide and it is encircled by pinewood. It can be reached through the road that leads to Punta Ala just after having passed Torre Civette and walked through the pine trees. North of Follonica, at Torre Mozza and Carbonifera you will find long, beautiful, sandy beaches, whose charm is somewhat spoilt by the industrial plants of Piombino that are clearly visible. The landscape of the Gulf between Piombino and Follonica is characterized by the presence of various towers, whose presence has specific historical reasons. The oldest is the Torre Mozza, erected in the first half of the 6th Century as a lookout post against the Saracen raids which for centuries infested the Tuscan coastline. A similar function was also covered by the so-called Torre del Sale. The Torre del Sale [Salt Tower], so called for its nearness to the old salterns of Piombino, is situated on the swampy plain between the promontory of Piombino and the hills of Campiglia Marittima. The third tower which stands out on the horizon, also from the 9th Century, is known as Carbonifera, whose name is derived form the function as a commercial stop-over as a terminal for the railway which brought coal to the sea from the mines of Montebamboli, in the hills behind between Suvereto and Massa Marittima. 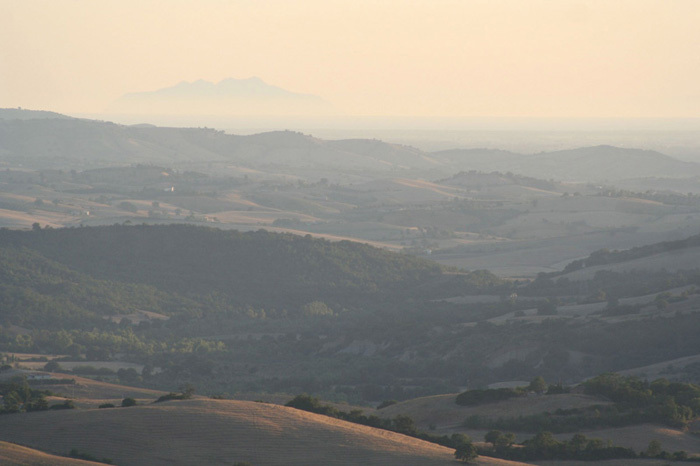 The half-wild and barely populated hills of the Val di Cornia extend alongside the river between Campiglia Marittima and Piombino. The umbrella organization I Parchi della Val di Cornia is made up of six parks in the region: the Mediterranean scrub vegetation of the Parco Naturale di Rimigliano and the Parco Naturale di Sterpaia, the green wooded hills of the Parco Naturale di Montioni and the Parco Naturale di Poggio Neri, and the archeological parks of Populonia and San Silvestro. The Parks are very near one to the other, and consequently visitors are given the opportunity to follow an itinerary beginning in the Parchi costieri della Sterpaia e di Rimigliano, where the sea joins the woods. The Parco Naturale della Sterpaia stretches along the Livornese Tyrrhenian coast, in the wide gulf between Piombino and Follonica, and occupies an area of about 296 hectares Here we have a rare and highly-prized humid forest, which was typical of the landscape of the ancient coast of the Maremma. Miraculously surviving deforestation, it was reclaimed by the municipal authority after the unauthorised lotting of the 1970s. Magical scenery through which to wander among ancient oak trees and woodland fauna, over the sandy dunes and down to the sea. How to get to the Park: along the Variante Aurelia (SS1) exit at Vignale-Riotorto. Go along the "geodetic" (the shortest route) road in the Piombino direction, then turn left (on the seaward side) into one of the sea access roads signed Parco Costiero della Sterpaia. Covering 7000 hectares between the Valley of Cornia and Pecora, in the range of hills between Massa Marittima and Superato. Within the Park, occupying the territory of the two bordering provinces, Livorno and Grosseto, there are two natural state reserves: the Marsiliana (440hectares) and Poggio Tre Cancelli (100 hectares). How to get to the Park (from Grosseto): along the Variante Aurelia (SS 1) exit at Follonica Est, then go towards Massa M.ma. After a few kilometres, before crossing the bridge over the river Pecora, turn left onto the provincial road for Montioni. Proceed for a few kilometres until the junction for Montioni; turn left again following the sign to Montioni. This itinerary is interesting mainly because of nature; in the area around the convent of Monte Muro we can admire several species of exotic trees planted at the beginning of the last century: the Atlantic Cedar, the Black Corsican Pine and the Douglas Pine, that have grown in a surprising way, thanks to the favourable climatic conditions. Following the provincial highway between Follonica and Castiglione della Pescaia we arrive at Puntone, where there is also a bus stop. We turn left after the bridge and go straight on for about 1.8 km. before turning right at the junction for the Convent of Monte Muro. We go straight on as far as Fosso al Leccione, where we park the car at a barrier. At the barrier we take path no. 24 that passes through the wood. Holiday accomodation | Podere Santa Pia, hidden in the valley between Castiglioncello Bandini and Cinigiano. The formal cloister is a perfect holiday house with breathtaking views on the Maremma. The most interesting artistic, historical and cultural sites of southern Tuscany are nearby, and are awaiting your discovery.